$2.30 per bottle - SAVE $1.55! $2.09 per bottle - SAVE $7.20! $2.04 per bottle - SAVE $15.70! $1.98 per bottle - SAVE $25.50! Avalable in five deliciously smooth and creamy flavors: Chocolate, Vanilla, Strawberries & Cream, Caramel, and Bananas & Cream. Our shakes are incredibly versatile. Shake well, serve cold, and enjoy our shakes as a delicious meal replacement, a satisfying snack, or workout fuel. Try them on their own, in hot or cold cereal, mixed into your favorite smoothie, as creamer in your coffee or in other protein-packed recipes. 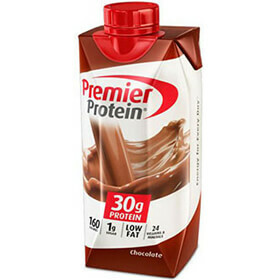 Water, Premier Protein® Shake Protein Blend (Milk Protein Concentrate, Calcium Caseinate, Whey Protein Concentrate), Cocoa Powder (processed with alkali), Contains 1% or less of the following: High Oleic Sunflower Oil, Inulin, Cellulose Gel and Cellulose Gum, Magnesium Phosphate, DATEM, Salt, Natural and Artificial Flavors, Sucralose, Acesulfame Potassium, Carrageenan, Vitamin and Mineral Blend (Sodium Ascorbate [Vitamin C], dl-alpha Tocopheryl Acetate [Vitamin E], Zinc Amino Acid Chelate, Biotin, Vitamin A Palmitate, Niacinamide, Potassium Iodide, Copper Amino Acid Chelate, Calcium D-Pantothenate, Chromium Chloride, Cyanocobalamin [Vitamin B12], Phytonadione [Vitamin K], Sodium Molybdate, Sodium Selenite, Folic Acid, Cholecalciferol [Vitamin D3], Pyridoxine Hydrochloride [Vitamin B6], Thiamine Mononitrate [Vitamin B1], Riboflavin [Vitamin B2]), Ferric Orthophosphate, Manganese Sulfate, Tripotassium Phosphate, Dipotassium Phosphate, Sodium Polyphosphate.